Peter R. Johnson, PhD, CCC-SLP, earned his MS and PhD in Speech-Language Pathology at the University of Pittsburgh and an Executive Graduate Degree in Healthcare Financial Management from Ohio State University. As a healthcare consultant , Dr. Johnson develops continuing education programs, coaches one-on-one mentoring, and assists in the development of memory units. His previous experience includes working in acute care, home care, outpatient clinics and long-term care. Dr. Johnson served as a Column Editor for the American Speech-Language Hearing Association (SID 13) Dysphagia Newsletter and the (SID 11) Administration and Supervision Newsletter. He is a four-time recipient of the President's Award and the Outstanding Service Award from the Florida Association of Speech-Language Pathologists and Audiologists. He is the Chair of the Florida Department of Health State Licensing Board for Speech- Language Pathologists and Audiologists. 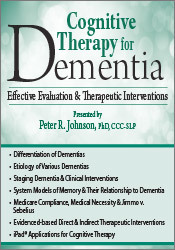 Dr. Johnson has co-authored several books including Business Matters: A Guide for the Speech-Language Pathologist; Drugs and Dysphagia: How Medications Can Affect Eating and Swallowing and Practical Pharmacology in Rehabilitation: Effect of Medication on Therapy and the newest book, A Clinician’s Guide to the Successful Evaluation and Treatment of Dementia, published in 2016. Financial: Peter Johnson has an employment relationship with Select Medical. He is an adjunct faculty member at Nova Southeastern University. 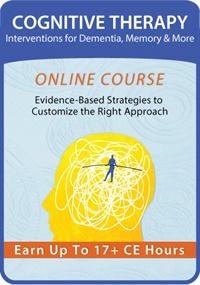 Dr. Johnson receives royalties as an author for Pro-Ed and Human Kinetics. He receives a speaking honorarium from PESI, Inc.
Nonfinancial: Peter Johnson is a board member and vice-chairman for the Florida Department of Health/Board of Speech- Language Pathology and Audiology.